In May 2018, former senator Lee Rhiannon questioned SBS’s then managing director Michael Ebeid over planned coverage for the 2019 event, particularly in the wake of the massacre of Palestinian civilians in Gaza in May. Such charges at the Guardian are nothing new, and in fact arguably reflects the official position of the media group as expressed in an editorial last month on the Gaza “protests” that included the simply risible accusation that the IDF has been “killing” unarmed slogan-shouting Palestinians who “posed no credible threat”. However, based on the Guardian article embedded in the sentence where Convery makes her claim, it’s clear this ‘massacre of civilians’ took place during riots on May 14th, 2018. 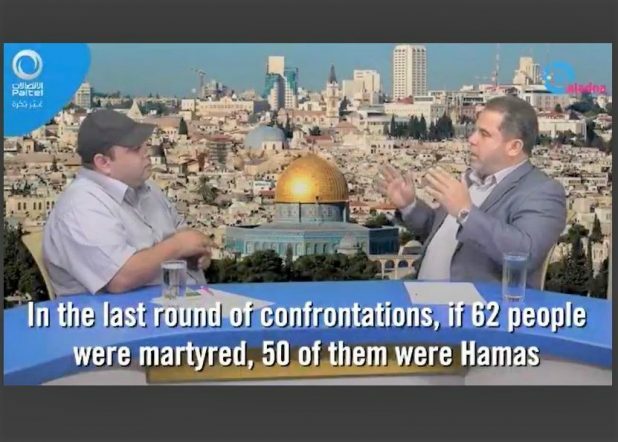 However, as we informed the journalist via a tweet, a Hamas official the following day acknowledged that 50 of the 62 Palestinians reported killed that day were in fact Hamas members. Another three were identified as Islamic Jihad members, which means that 85% of those killed that day were combatants. These numbers are consistent with an examination by Meir Amit Terrorism and Information Center revealing that most of the rioters killed between March 30th and Jan. 14th were similarly operatives of terror groups. Guardian editors have thus far failed to respond to our complaint. When they are not “protesting” on the way to attempted mass murder in Israel they are doing some serious shopping in Gaza. Always remember that they voted for Hamas and that Hamas now holds them all hostage with the financial aid of Qatar and Western tax money #NGO . Here are my two favorite Gazans stocking up on middle class supermarket items…. Or making sure that their overlords live in luxurious mansions. Is it not time for the Guardian to be sued for libel – if not in the UK (I am familiar with the pragmatic arguments against this) then in Australia. There are so many pictures which not only clearly illustrate Israel’s case, but also by themselves tell the right story. The soldiers of the IDF have no obligation to let themselves of their fellow citizens be lynched – faced with thousands and sometimes tens of thousands – potential or actual rioters, harbouring within their midst hundreds of armed terrorists. @Paul, I seem to remember that British courts have held that countries do not have standing to sue for libel. It wouldn’t surprise me if they made an exception for Israel i.e., that other countries could do it. I am not advocating that the libel actions be engaged in the name of a country. States where potentially dangerous laws allowing criminal prosecutions for the libelling of countries exist are either not democratic or the most illiberal of democracies. The Guardian should be sued in the name of one or more of the very many identifiable individuals who have been lied about and made the object of the false accusations in question. I would disagree in that criticizing and libel are not the same thing. We could say that China’s occupation of Tibet is brutal and oppressive. That to me is not libel. If we were to say that, after evicting them from their homes, the Chinese army executed the entire population of Larung Gur by chopping off their heads one by one, without any proof or with proof to the contrary, that would be libel. That of course is JMO. Guardian reporters massacre an untold number of civilians in Gaza. Editors fail to reign in murderous staff. Involved in withholding evidence. Possible war crimes committed by Guardianistas. Tabloid media at risk of losing market share to flailing mainstream publications. Tommmy Robinson’s Panorama sting will help sink the MSM.